One man. One mountain. No rope. 3,000 feet in air on the north side of Yosemite Valley, world-class climber Alex Honnold clings to the face of El Capitan, with only minor variations in the texture of the rock determining where he can and can’t support himself. The stakes are high, as they always are for Honnold, but in this moment they are taken to an extreme. The new National Geographic documentary “Free Solo” follows Honnold as he prepares and attempts to climb the face of El Cap alone with no rope to provide security. Needless to say, the margin for error is nonexistent. “El Cap was something I had been thinking about for many years but not actually doing and so I kind of needed some kind of extra push to start putting in the effort to make it happen,” Honnold told The DePaulia. That motivation came by way of filmmakers E. Chai Vasarhelyi and Jimmy Chin, who is also a professional climber, who came to him with a proposition for what eventually became “Free Solo.” Most importantly, he said, the agenda behind the climb remained the same. 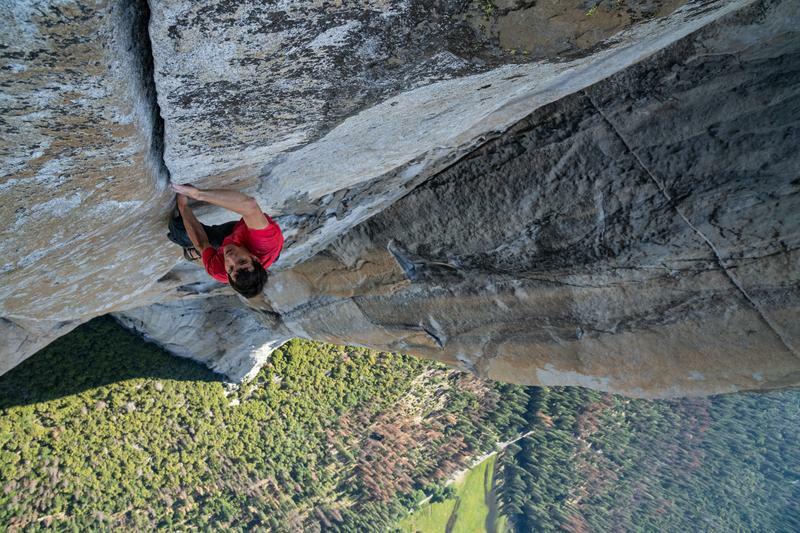 “Alex isn’t climbing El Cap for the movie, he’s climbing for himself,” Chin said. Initially, Chin had some reservations about this project due to the danger involved and the pressure a film crew might add for Honnold during the climb. Eventually, Chin was able to move past those reservations. Rising through the climbing ranks over time, Honnold has become one of the biggest names and faces in the sport, a position he never envisioned for himself. About 10 years into his climbing career, he began to receive a few sponsorship deals, proving that he actually could sustain himself with a career in climbing. Today, Honnold is one of the most prolific and talented solo climbers in the world. Still, two years of relentless preparation are what made the final ascent of El Cap possible. Aside from the obvious physical demands of free soloing a 3,000- foot sheet of granite, the stakes were so high that each and every movement needed to be memorized. Each foothold, each change in texture of the rock and each complicated movement were etched in Honnold’s memory by the time he started his climb. Any mistake meant death. To add more pressure, a professional film crew was capturing every movement, an impressive feat in itself. The camera crew was comprised entirely of professional climbers with years of experience under their belts, making “Free Solo” into what it is. Without the experienced crew, “there’s just no way you can move or even understand how to shoot in that environment and choreograph all those people to do that kind of shooting,” Chin said. Even more than the physical and technical demands of the job, their experiences as climbers also added to their ability to get into the mind of a climber and anticipate what they are thinking and the pressure they place on themselves, he said. Included in that is the fact the soloing is a hardly talked about aspect of climbing, due in large part to the stress it places on both the climber and the friends and family members that are now concerned about their loved one. Because of that, Honnold typically tells no one about his climbs until after the fact. This time though, the challenge that soloing El Cap presented could not be tackled by him alone. “In this case, I think that El Cap was big enough and hard enough for me that it was definitely helpful to be able to talk it through with some of my friends and seek out some expertise and to have people to help me in the process,” Honnold said. For non-climbers it can be easy to dismiss the sheer difficulty of this climb when considering all the other dangerous expeditions that experienced climbers do regularly. Emphasizing the enormity of El Cap became key for Chin. Climber or not, “Free Solo” is gripping throughout and tells a universal story perfect for anyone facing challenges.